Helen O'Connell : Big band vocal charts from Helen O'Connell. A selection of Helen O'Connell vocal arrangements for solo vocalist with big band. Born in Lima, Ohio, she grew up in Toledo where, by the age of 15 she was singing in local clubs, hotels and on the local radio. She moved to New York where she began her big band career with Larry Funk in Greenwich Village where she was discovered by Jimmy Dorsey's band manager. 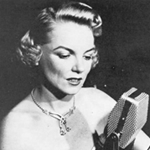 She joined the Dorsey band in 1939 and had several notable early successes with the band's other vocalist, Bob Eberly. She retired from the business when she married in 1943, and restarted her career following her first divorce in 1951. Helen did regular television appearances from the 1950's through to the early 1980's. Which charts was she best known for? Her first big hits were with Dorsey - "Green Eyes", "Amapola" and "Tangerine" - all duets with Bob Eberly. She released a number of notable albums, some with the Marion Evans Orchestra, including such songs as "Time Was", "When the Sun Comes Out", "Brazil", "Just Me, Just You" and "Not Mine". Other great charts were her version of "Witchcraft" and "It Could Happen To You".